Thirsty Pilgrim: Eggnog Hedonism, Beer Optional. My theory is that pasteurized, relatively low-fat, store-bought eggnog has turned a whole generation against the stuff. Here's one way to make the real thing, plus a couple of useful variations for your holiday imbibery. This is for all you decadent foodies out there who prize flavor over arteries. Separate four eggs. Beat a 1/2 cup of sugar into the yolks until smooth. Stir in 1-1/2 cups of milk. Whip 1 cup of cream until frothy then add to mixture. Beat egg whites and then fold into the rest. Add healthy shakes of nutmeg and cinnamon. Now you've got nog that tastes as naughty as it sounds. Next: Let's make Beernog, which is the whole reason we made nog in the first place. Full credit goes to Randy Mosher's book Tasting Beer, which has some odd holiday ale concoctions near the back. With luck you already own this book or will be opening it on Friday morning. If not, you can buy it here. Pick out a nice, strong ale. Mosher suggests Anchor Christmas. Many Belgian holiday beers would do nicely. We've used Rochefort 10 to tasty effect, but our favorite so far has been Hercule Stout — the coffeeish roasty taste adds a certain something. Other strong or imperial stouts are bound to fare well. I've also been thinking a Schneider Aventinus or other malty weizenbock/doppelbock beers would succeed. All are worth trying: with that nog base, it's nearly impossible to make something bad. I'd avoid hop bombs, but even those might turn out all right. Pour about 1/3 glass of beer. Add a 1/2 shot of whiskey, rum, schnapps, eau de vie, or whatever hooch suits your fancy. Top off with the nog. Stirring is optional, and you can watch as the layers sort themselves out anyway. Sip. Savor. Enjoy. Best done next to a roaring fire. 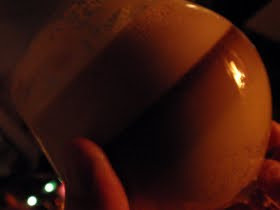 An interesting effect of the beer, besides that warmth that spreads from your belly to your face: it actually lightens the thick, eggy, creamy nog. More proof that beer is good for you. You don't drink alcohol, or are hungover perhaps? Here's another option I've been pondering: coffee. 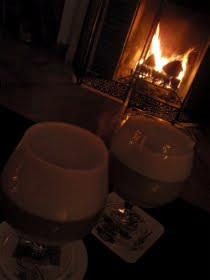 Based on the stout success I think 1/3 glass of strong, chilled coffee would be gorgeous with some nog. Maybe for a healthy breakfast on Boxing Day. good call! Its been years since I've had the real deal.. and I have an under-carbonated homebrewed imperial stout that would go fantastic in this!